I could really use a holiday right now! Unfortunately baby Kick is still too little but I am already searching for places where we could go to next year. The Perivolas Resort is one on my wish list of place to stay. This gorgeous hotel is poised on the cliff high above the Aegean, on the island of Santorini in Greece. The interior is stunning, I love the (subtle) use of color. There are no TVs by the way as it is a place to switch off. A place to read, recharge, relax, sleep, rest, and dream. I am wondering though if they will appreciate quests with small children.. Originally designed as a family home, Perivolas still feels like a private residence. Intimate in scale and atmosphere, every house is different. 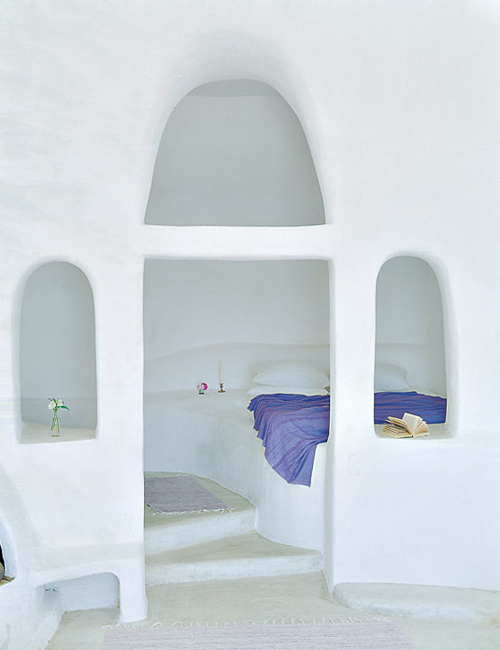 Built by native craftsmen using local materials, the interiors embody Cycladic style, with its organic forms and smooth surfaces. Breezy rooms are naturally cooled by sculpted stone walls and vaulted ceilings pierced by skylights. Beds are built into snug alcoves, adorned with a posy of hand-picked flowers. 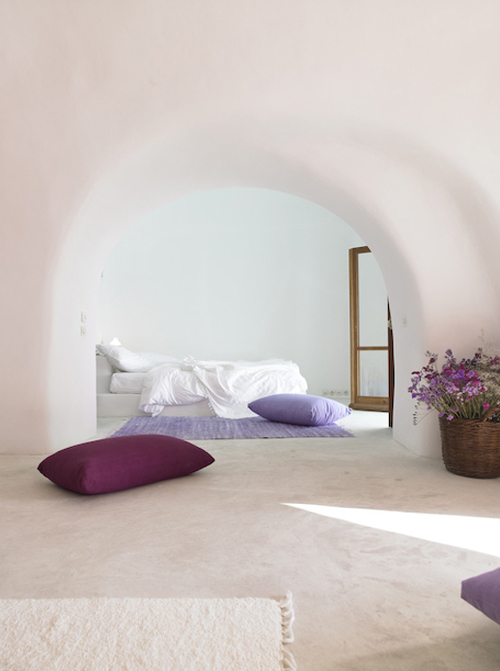 Niches and archways are scooped out of whitewashed walls, low-slung sofas offset by hand-woven rugs and cushions in vivid fuschia and lilac. Timeless and quietly glamorous, interiors are pared down so that nothing distracts from the show-stopping views and nothing disturbs the intensity of the stillness. Simply perfect! I didn’t know you had a baby…Congratulations!! This resort looks so relaxing. I love the way they use colored pillows, throws and rugs against the white wash to give it an understated fun but relaxing atmosphere. Hope you make it there next year. 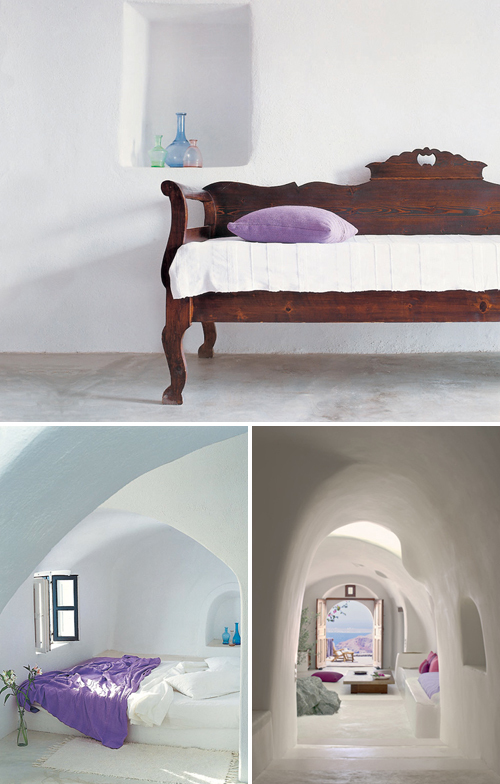 Just stunning, and very soothing – think it must have something to do with that Greek light! I’m a design addict and a great fun of your site and your e-shop. I’m greek and have spent all my holidays in Santorini which is my favorite island. I suggest you to check out three more hotels in the island, that I find even more amazing: http://www.mystique.gr, http://www.katikies.com and http://www.tsitouras.com. If you ever go there I would be more than happy to send you information about the best places to visit. Great place! Santorini is lovely. Especially the little town of Ia. Greet sunsets! We are planning to go island hopping this summer with the kids (wil be 7 and 9 by the time). Any tips? How beautiful! Just the photos look relaxing. Perfect indeed! This resort is the best! Wow – I would never leave these rooms. Stunning. Love the touch of turquiose. Yes, simply perfect. Great photos of a Great Greek island.